Already an active WITI Member? Please visit the Member's Area for new free videos from our 2004 National Conference as well as acess to discounts and the Members Directory. October is National Breast Cancer Awareness Month, so I'm focusing this issue on some of the things that we know about breast cancer. Antibiotic use - a new study found that antibiotic users had a 50% higher risk of breast cancer and the higher the use, the higher the risk. Researchers believe that the antibiotic use was due to chronic inflammation, which was linked to cancer and heart disease. 2004 is coming to a close; do you need help figuring out "what next?" Do you want to explore what your life purpose is, so that you can create a "Mission Statement" for your life? Please join us for a WITITalk Teleclass. Participants in this teleclass have made major changes in their life, after just the first class! Can They Stop Your Career? Consultant B.J. Gallagher has noticed something odd. People feel stymied in their careers and say the reason for it is that, "They won't let me." There are many variations on this phrase: colleagues warning, "They won't let you get away with it"; initiatives stopped because, "They won't do it"; and workers frustrated because "They won't change." This inspired B.J. to investigate these barriers to success and led her, along with Steve Ventura, to write Who Are "They" Anyway? (Dearborn, 2004). Next Week! Peggy Klaus at WITI Los Angeles: "Raising Your EPQ: Executive Presence for Everyone"
In October 2001, just a month after the horrendous terrorist attacks of September 11, my company, Women For Hire, held one of its largest career expos ever in New York. Nearly 70 leading employers committed to recruiting at this event, which was no small feat given the economic beating the city took in the wake of the collapse of the Twin Towers. In the midst of the normal chaos of finalizing every detail the day before our event, I received a surprise phone call from President Clinton. After I got over the initial shock that it wasn't just my husband playing a crazy joke, I listened as the former President congratulated me on Women For Hire's success. He reminded me that at the core of our freedom and financial independence in this country is the right to work, and he encouraged me to keep up our efforts. All that in under a minute. If you're burned out on buttons and bummed out by bumper stickers, you need a new, cooler way to stand up and be counted. What could be cooler than a Waving Watch? 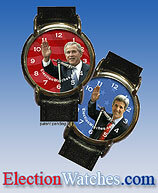 Featured on CNN, FOX, Newsweek The Daily News, Boston Globe and others, this watch is destined to be the most coveted collectible of the election season. It's a great conversation piece, a great gift, and a great way to show your candidate's support in a subtle, sophisticated fashion. The watches start at $25 and upwards depending on the type and quantity you order. There's a full money back guarantee if you're not satisfied. WITI Members: Receive a 10% Discount when you the enter "WITI" into the special promotional code box at the Electionwatch Store. When you do so, an additional 5% of profits will be donated to WITI so they can report on women's issues in politics! Robin Raskin of ElectionWatches.com will be at the WITI booth at Digital Life on October 14-17. Drop by and say hi! For more information or to register, visit gartner.com/eu/symposium today. Gartner also has many other upcoming events! Please visit our Partner Events list for event information. Network face-to-face with recruiters from top employers at the Women For Hire career expos. A great opportunity for technology professionals! Meet with companies such as BAE Systems, Bloomberg, Boeing, CH Robinson, Cisco Systems, Citigroup, Honda, HSBC Bank, IDX Systems, Integic, JetBlue, Level 3, Nextel, Northrop Grumman, Raytheon, Shell Oil, Sanofi-Synthelabo, Swales Aerospace and MANY MORE! All events from 10 a.m. to 4 p.m. Free admission for professional women. Resumes and business attire required. Register today for a special early morning seminar prior to each event! Women For Hire CEO Tory Johnson will lead a networking session from 8:30 a.m. to 10 a.m. where she'll share inspiring and practical jobsearch advice. All attendees will receive a copy of our new book, Women For Hire's Get-Ahead Guide to Career Success, and priority admittance to the career expo! Visit www.womenforhire.com to register. This one day event includes Case Studies, Best Practices, Latest Trends, Stats & Facts, Interactive Sessions & more. Coming to Boston, MA, on October 14, 2004. WITI Members: Get $200 off the regular rate! Please visit the Members' Discount Page for the promo code. Register today at www.mobilemarketingroadshow.com or call 212-330-8381. Paladin International and Business and Technology Insider Radio are bringing you an entire format to prepare you to talk directly with federal agencies about specific opportunities. Don't walk away scratching your head about where to go next...come to "Marketing to the Federal Government" at the Sheraton Premiere in Vienna, VA on Nov 2-4, 2004, and be ready to talk real contracts! Confirmed participants include DHS, ARMY, Commerce, NASA, HHS, DOJ, DSS, OPIC, GSA Advantage and more! We have the Contracting Officers from some of the major agencies presenting contract opportunities. Accomplish more with us in 3 days than you can on your own in a month or more! For more information, visit www.technologyinsider.net/mfg04/. At Intel, we not only believe that people are the greatest investment in a company - we live it. Intelligence. Innovation. Creativity. Culture. These are principles that drive us. We're using these principles each day to create an inspiring workplace where inspiring ideas are rewarded. Discover why the Intel workplace is such a great place to work. Search for Intel jobs on WITI4Hire. Director of Area Accounts - Novell Inc.
NOVELL INC., a leading provider of information solutions, is seeking a Director of Area Accounts for its Southeast region. This individual will lead Account Executives to achieve sales coverage and customer satisfaction objectives of named accounts. Responsibilities will include positioning Novell for long-term success through identifying and closing deals that generate revenue and are of strategic importance in the customer's business and set the stage for larger follow-on sales; building relationships at the executive level with clients; and creating ongoing relationships so the company is positioned for long-term wins. Second Annual "Women Leading Reinvention and Innovation"